Rene’s discussion on horses in the Civil War included man’s relationship to the horse and why over a million horses and mules died in the war. The ancestral horse was discussed as well as purchasing horses, care and diseases of horses, and horses in battles such as in the Peach Orchard and the Bliss farm in the Battle of Gettysburg. Pictured on the right are some of the eighty-eight horses of Capt. 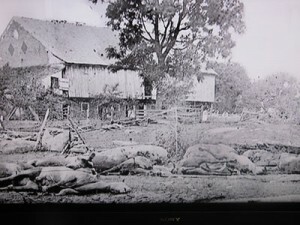 Bigelow’s battery killed at the Trostle farm. Famous horses of generals were mentioned and the fact that Gen. Grant permitted the Confederates to keep their horses after the surrender at Appomattox. This entry was posted in Meeting archive on July 19, 2011 by hlj. Our masthead includes an image of an original painting by Mort Künstler, "With a Rebel Yell", Second Manassas, August 29, 1862. Used with permission. ©2002 Mort Künstler, Inc.